National Nanotechnology Day is an annual event held in the United States on October 9. It was launched by the National Nanotechnology Initiative, a U.S. federal government program for the science, engineering, and technology research and development for nanoscale projects. The term “nanotechnology” refers to a field of science and technology that deals with manipulation of matter on an atomic, molecular, and supramolecular scale. According to the definition given by the National Nanotechnology Initiative, nanotechnology is the manipulation of matter with at least one dimension from 1 to 100 nm. Nanotechnology allows to create materials with unique properties, such as graphene. It helps advance the development of medicine, chemical industry, computer technology, microelectronics, robotics, and other fields. National Nanotechnology Day was established to raise public awareness about nanotechnology, how it is used in products that enrich our daily lives, and the opportunities and challenges it holds for the future. 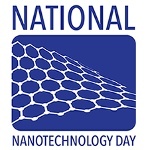 The National Nanotechnology Initiative launched the National Nanotechnology Day campaign in 2016. The date of October 9 was chosen to pay homage to the nanometer scale; 1 nm equals 1 x 10-9 m (one billionth of a meter). On or around this day, American scientific and educational institutions organize practical demonstrations, lab tours and open houses, seminars, discussions, lectures, and other events and activities aimed to educate people about nanotechnology.